Until the founding of the State of Israel the Jewish and Arab populations had separate ruling bodies under the British government. This is the reason why separate censuses and voters’ lists for the Jewish population can be found for the period up through 1948. These documents are found in different archives, usually depending on the type of the document. This article includes a limited survey of those documents in places that are considered to be “urban settlements” today. This information is based on the collection of the Israel Genealogy Research Association’s “All Israel Databases”. Most of these documents are already searchable in either Hebrew or English on the IGRA website. IGRA believes there are more documents to be found in the various archives and will endeavor to find them. In addition to documents of the governing bodies, in the 19th century, Sir Moses Montefiore had five censuses conducted in 1839, 1849, 1855, 1866 and 1875 in Eretz Israel. The original censuses, which are in Hebrew, are found in London at The Montefiore Endowment. A database of these censuses has been built and can be searched in Hebrew or English at the following site. All the settlements mentioned in the censuses are part of Eretz Israel, except for some settlements that are not part of Israel today such as Alexandria, Beirut, and Sidon. At the same time during the Turkish rule, up until the end of World War I, various types of lists were kept by the Turkish administration. These are known by the name Nufus and scans of the microfilms of these are available on the website of the Israel State Archives. Most of the information about the Jewish communities is in Turkish, though there are a few instances of lists in Hebrew. A comprehensive survey can be found in Hebrew. Under the British Mandate of Palestine the Jewish population had its own ruling bodies that were responsible for their self-government. 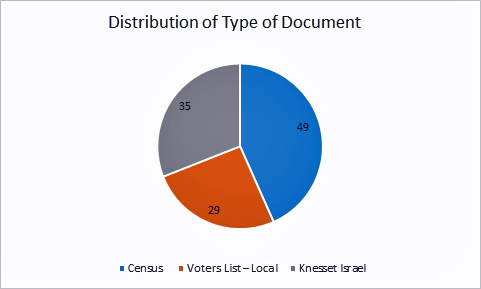 Three types of documents can be found for this period: censuses, voters’ lists on the national level for Knesset Israel and voters’ lists on the local level. The voters’ lists for Knesset Israel are found mainly in the Central Zionist Archives, whereas the voters’ lists for local government and the censuses are found either in the Israel State Archives or in the local municipal archives. The documents can be divided into three types: censuses, voters’ lists for local government and voters’ lists for Knesset Israel or the national governing body for the Jewish population. In the 19th century the main documentation was the five Montefiore censuses. The four holy cities of Jerusalem, Hebron, Safed and Tiberias appear in all five censuses, whereas other urban settlements mentioned may appear in only some of the censuses. The first census conducted during the British Mandate period was in 1922, but all that remains are the sections of Tel Aviv and Petah Tikva. IGRA has found some censuses that were conducted on a local level. The largest collection of voters’ list for Knesset Israel is for 1942 and includes over 150 towns and settlements. Since this includes citizens of the age of 18 and above, it can be considered as a substitute for a census. But there is no way to estimate how many people refused to participate in the elections for ideological reasons. There is also a census of the Shomer Hazair kibbutzim that was conducted in 1942 but it is not included in this analysis as they are not urban settlements. Each document for each urban settlement is counted individually. With the growth of the Jewish population, new lists and updates were prepared for election held on both the local and national level. 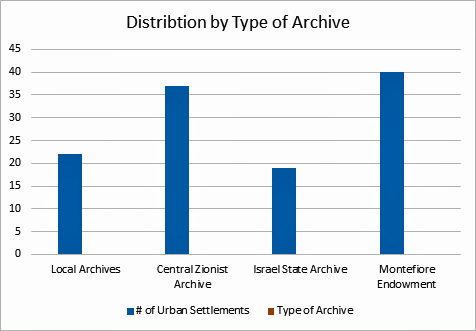 This is reflected in the growth of the number of documents already found by IGRA during the British Mandate period. In 1942 elections for Knesset Israel, 22 of the 33 urban settlements in this survey have voters’ lists that were found in the Central Zionist Archives. There are more files at the CZA that include updates to the voters’ lists and these have not been included in the IGRA collection as of the time of the writing of this article. In addition new towns were founded after World War II, which then had elections. 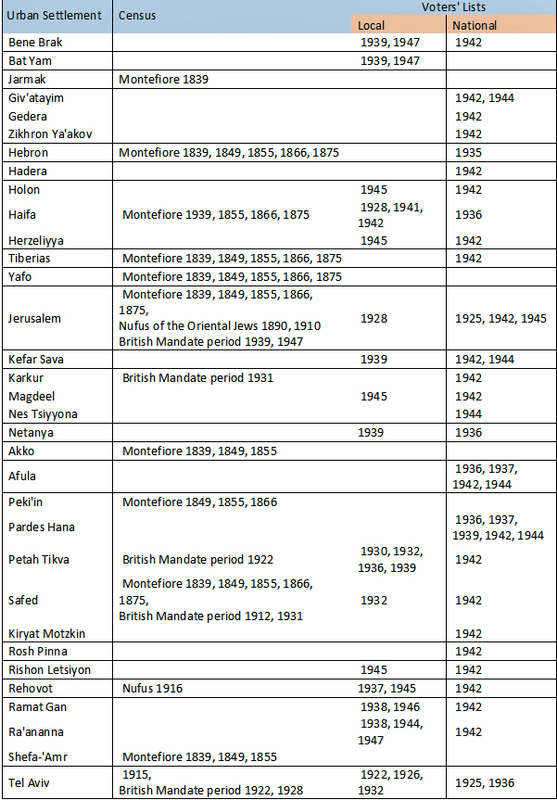 A few of the smaller settlements that were included in the Montefiore censuses may not have had enough Jewish residents in 1942 to have their own list or had been incorporated in a nearby larger Jewish settlement, such as Jarmak, Shef-‘Amr and Peki’in. The following is a list of the 33 urban settlements and the type of document and year of the document that IGRA has found so far. IGRA knows that this list does not include all the lists for the above settlements, and that there are probably other urban settlements that have lists that are not mentioned. An example would be small independent neighborhoods that were later incorporated into larger local councils or towns. The aim of this list was to develop a benchmark for IGRA to find additional lists of these three types to include in its collection. Born in Chicago, Rose has lived in Israel over 47 years. She has a Master’s Degree in Research Methods and Measurement from the School of Education at Tel-Aviv University. Rose Feldman is on twitter as jewdatagengirl, Israel Genealogy, and IGRA_Hebrew, one of the administrators of the IGRA facebook, and in charge of developing new databases for the Israel Genealogy Research Association (IGRA). She was the webmistress of the Israel Genealogical Society for nine years. She has lectured at 12 IAJGS conferences starting in 2003, at the annual seminars of the Israel Genealogical Society and their branch meetings. She is coordinator of the databases on the IGRA website and participated in the Montefiore Censuses Project. Rose was also the webmistress for the 2004 International Association of Jewish Genealogy Societies’ conference which took place in Jerusalem and has four Kehilalinks sites on JewishGen for Mscibow, Ruzhany & and neighboring Kossovo in Belarus, Litin and Kalinovka in the Ukraine. She has a website. The article states, “These are known by the name Nufus and scans of the microfilms of these are available on the website of the Israel State Archives.” I could not find these on the ISA website. Do you have a cite or way to see these? It seems that the scans of the microfilm have been taken off the website of the Israel State Archives. I can only hope that they decided to scan the originals and post them. Try writing directly to them through the “Contact Us” on the front page of their website. My Grandmother, Fannie Shore left Jaffa July 1903 for Ellis Island via ship out of Le Havre. Am looking for any records as to when she arrived in Palestine with her family (Father Hersche – Mother Lina/Leya). She was born in 1888 and some records say she was born in Libau, Russian Empire, while others list Palestine. Any assistance is greatly appreciated and any cost will gladly be sent. There are few if any records for this period. IGRA has yet to find any records dealing with ships arriving or leaving. You might try looking for records in the port of Le Havre. There were ships going around to various Mediterranean ports and travellers from Palestine took one of these to a port where they could board a ship to cross the Atlantic. As to where she was born, people sometimes stated different places of birth according to what might be most advantageous to them at the time. If she was born in Palestine, then if there ever is a project of transliterating the nufus from Osmani Turkish (in Arabic script) you might find her and her family there. Good luck.